Fifteen years ago I hosted a HTTP server to send files to my friends and created my personal website using a HTML template I scavenged from the web. For a decent 10 years, I used a theme which had served me quite well during the Web 2.0 era up until entering the mobile landscape. A few years ago, I designed my own website style that you see today. Above all else, I wanted focus. I removed tabbed navigation that linked to pages with weak content and focussed on a single-column based page to showcase my software. I also wanted a simple flatter layout with more style than a text document from the 90s ðŸ˜Š. I write content in Markdown and use Jekyll to statically generate my HTML and blog posts. I created the CSS myself, which I did by looking up documentation and seeing how a couple other websites functioned. 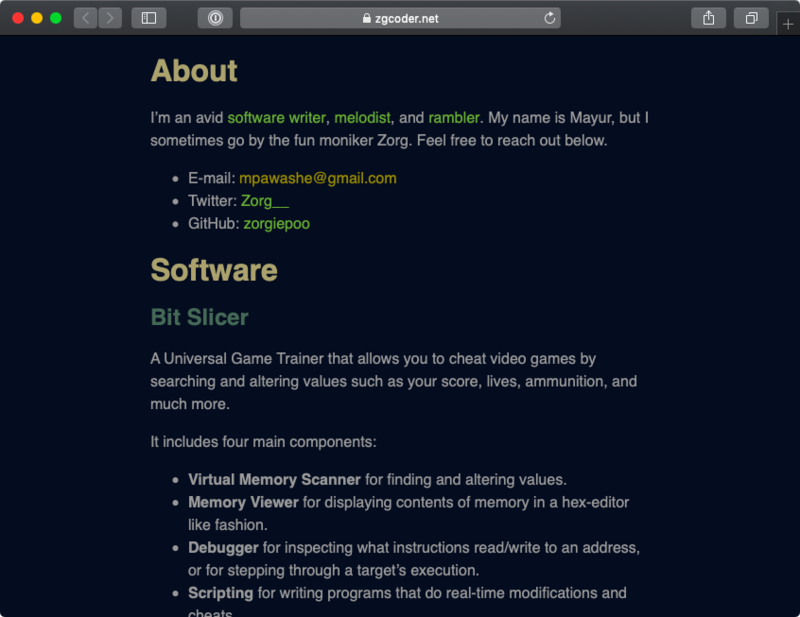 I ended up with a CSS style for the homepage and the blog that are both very short. Owning the stack means that I understand what goes into the generated website content, or at least that it would not be difficult to understand if I were to forget specific details. As always, less code is easier to maintain and I wanted to avoid validating and updating large dependencies (which often break compatibility). I can also adopt features or customize my website when I see fit. For example, if you have been visiting my website recently under Dark mode in Safari, you may have noticed the lights turned off. More systems and web browsers will support this mode in a matter of time. Overall, Iâ€™m quite pleased with how my latest website iteration turned out. While I admit this style may be tailored to a personal sort of feel, I hope this style serves me well for the next decade. When it becomes dated, I should not have a difficult time updating it due to having minimal dependence. In spirit of this post, I have posted this theme on GitHub hoping that it may encourage others that designing a website isnâ€™t so daunting and can be very rewarding!